A Father’s Day fire destroyed a home at 16 Charles Hill Rd. Sunday, sending up a plume of smoke visible for miles and making the day a memorable one for a local family. The fire broke out at around 10 a.m. Sunday, prompting a flurry of calls and tips to our Tip Line. A neighbor spotted smoke and flame billowing from the garage and warned the two adults and two children inside the house when the fire began. All made it out safely but the garage was destroyed and the home heavily damaged. 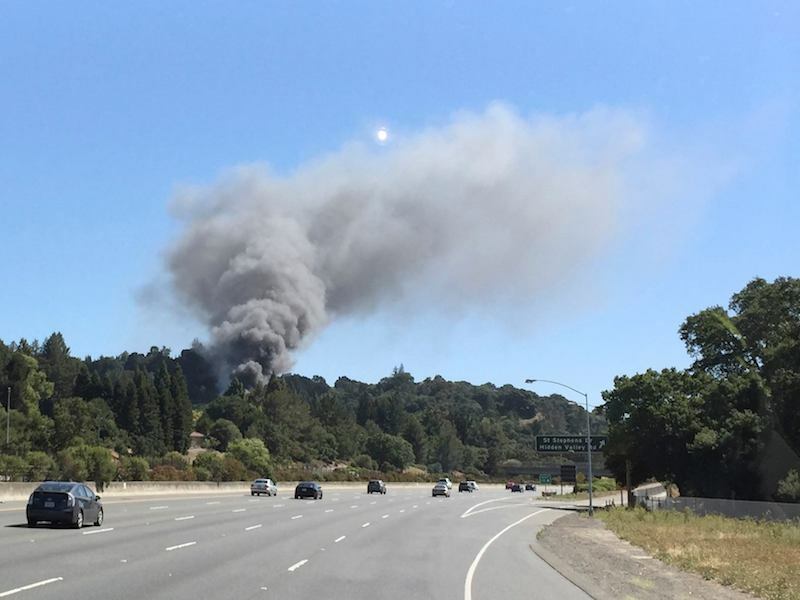 A total of nine engines from the Moraga-Orinda Fire Protection District and adjacent Contra Costa County fire were needed at the scene. There were no major injuries though a firefighter suffered a minor burn. An MOFD fire crew remained at the scene on “fire watch” on the site, located on a steep hillside, to make sure no additional flareups were reported. The cause of the fire and estimate of damage have yet to be determined. Previous articleTo All The Dads Out There – Have A Great Day! Losing your home on Father’s Day, awful. I hope the residents are ok.